(Over the River and through the Woods to Grandmother’s House We Go) x 2. We blew the first rule of green living. We try to live simply, but with seven people in this family, it’s not so simple. Our new Toyota Sienna, purchased when the cost of fixing the old Sienna was greater than its value by a couple thousand dollars, can theoretically transport eight passengers, all seat-belted. The two captain’s seats in the second row are each dedicated to a car seat—one for two-year-old Leif and the other for this year’s newest member, Lyra. The middle seat in the second row, which is almost as narrow as a coach seat on a commercial airlines, had to be removed in order to access the back row of seats. The back row, with the least amount of leg room possible as the middle seats have to be pushed all the way back to accommodate the toddler and infant car seats, might work if we had children under ten years of age, but note the heights mentioned above. Also, in this family, our height is all leg. Hugo and I have 32” inseams, Claude’s is 34”. 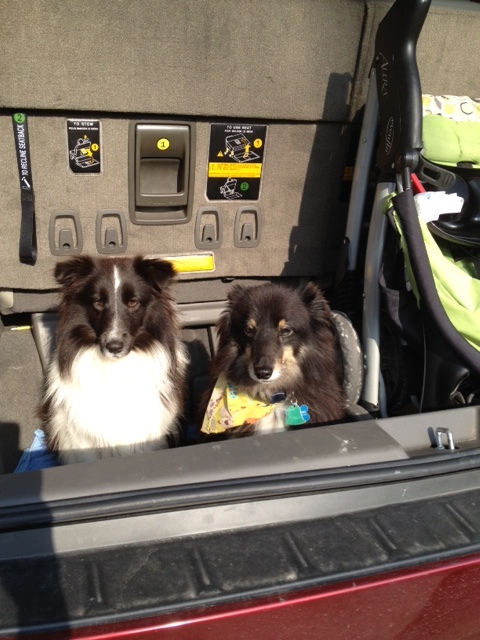 In the very back, where the families in the Sienna ads store their luggage, we have a folded down stroller, which we very much will use, and two Shelties. Those are dogs that look like little collies and luckily like lying together in close quarters. Where to put the turkey? The small suitcases of clothing? The diapers? The boys’ backpacks? My laptop? So much for simple living. We departed in two vehicles on two different days. I left yesterday in the Sienna with Jules and the babies, the dogs, the turkey and all that these beings needed. Max is leaving shortly in his Camry with Hugo and will grab Claude in Ann Arbor on his way up north to Grandma’s house in Charlevoix. Until the kids drive on their own to Grandma’s, I don’t see how we will be able to do it any differently. We are a modern family. Grandma is my stepmom. Grandpa is her husband but not my dad. My dad and stepmom, who married when I was three, divorced in the early 90s after Dad had moved to Arizona in 1990. My stepmom never joined him in Arizona and he never returned to Michigan. Fulfilling the cliché that is life, Dad met another woman with children of her own and eventually seemed to forget about us. My stepmom never did and she has been the primary grandparent of my boys’ lives until I met Max through whom they have gained a second set of grandparents. Even before Max and I began producing blonde babies of our own, Max’s mom claimed my three boys as full members, with all privileges, of her grand-brood. Every time I’ve had a baby, my stepmom was soon there to take care of us for as long as she could stay. As soon as they were old enough, my boys began spending many weeks each summer with Grandma and Grandpa in northern Michigan, their house just a block from sandy Michigan Beach on Lake Michigan. And we come up every other Thanksgiving for Grandma’s holiday dinner. Her herbed rolls, made from scratch and cooked in loads of butter, are worth every gram of fat. I’ve never mastered her herb rolls and I’ve told Jules, who began baking breads this fall, to pay close attention tomorrow. For years I have supplied the turkey, fresh-killed on the farm for which I host a co-op, which makes me sound like one of those über-mom-bloggers, but the way I host it is pretty lazy. All I do is reveal to the people in the co-op the code to my garage where I keep a refrigerator for the weekly deliveries. The members take turns (in alphabetical order) driving each Saturday to pick up the orders and bring them to the fridge in my garage. As a result, my food is delivered to my home every week. This year’s turkey was executed and sealed in a plastic bag on Monday and delivered to my garage fridge that evening. I popped him in the Playmate cooler before we left yesterday and later today I will brine the bird in the same cooler. Playmates are the perfect size for brining a turkey and with a fresh-killed bird brining is, in my opinion, necessary. When you buy your meat straight from the farmer who raised it, you inevitably learn a thing or two that you won’t pick up with your frozen Butterball. For example, meat must age in order to be edibly tender. We’ve all heard of aged beef, right? What that means is not some secret preparation, like the Kobe beef cattle who get massaged in life. Aging means a little decomposition. My fresh Tom hasn’t aged, but the brining will meet the requirements by helping break down his tougher connective tissues. Meanwhile, because he’s never been frozen, he’s not full of water. Nor chemicals or drugs because he’s also organic. Which I guess gets to my point—know what is real and what really is. Your meat was an animal with a body who enjoyed being alive but I enjoy eating meat more than letting some animals continue to enjoy life. I don’t eat animals from factory farms when I can help it. Factory farm animals didn’t enjoy life as much as my organic turkey, though I’m sure they didn’t want to die for someone’s meal. I am thankful for our food, the people who grew it and the creatures who died so we could eat them. If it sounds ecumenical, it should. That your blood relatives are genetically related is real. But real family are the people who show up, regardless of what you call them—mom, friend, brother, neighbor. Some of us are lucky to find family in our relatives. Some of us have to look beyond genetics to find our families. And my boys and I know the difference. We are all eager to get over the river and through the woods to my stepmom’s, and their very real grandma’s, house whenever we can. When we arrived at 11:30 last night, there was a pot of split pea & ham soup waiting for us on the stove and bread baking in the oven. 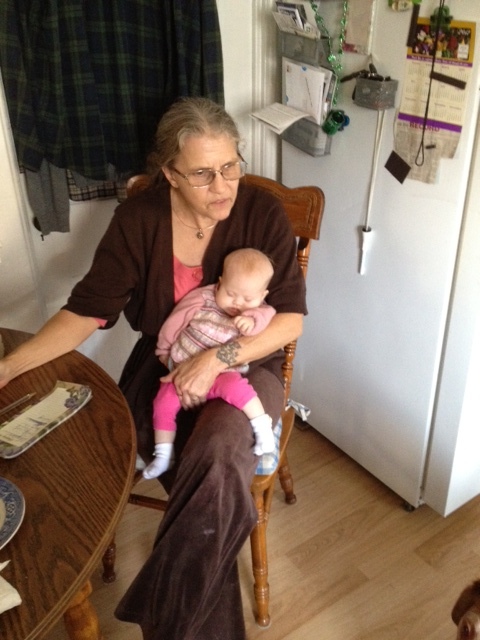 This entry was posted in Uncategorized and tagged Family Travel, Michigan, Organic Turkey, Thanksgiving. Bookmark the permalink. 8 Responses to (Over the River and through the Woods to Grandmother’s House We Go) x 2. You are very visual writer Holly. I enjoy your blog and catching up on your life. I’m flattered that you are following, Samantha. I think of you, as audience, when I think of topics and points related to the crux of my childhood. Thanks for reading. Your definition of family is ours. Happy Thanksgiving, we all have much to be thankful for! Buy a clam shell for the roof of the van. This was/has been my solution for travel with a large brood and 8 passenger Sienna for years, of course then I was the only driver and we had one car. Bless you all and grandma! Oh, Sidney, we have a pop-top. It no longer gives us enough room. Happy Thanksgiving! Your post got me all teary-eyed and cracking up and ready to share the holidays with loved ones. I count you among my loved ones, dear Holly. You’re a gem. As our you, dear Jessa. I only wish you lived next door with your men (and growing girl).